Naomi Novik – An Author to Read! 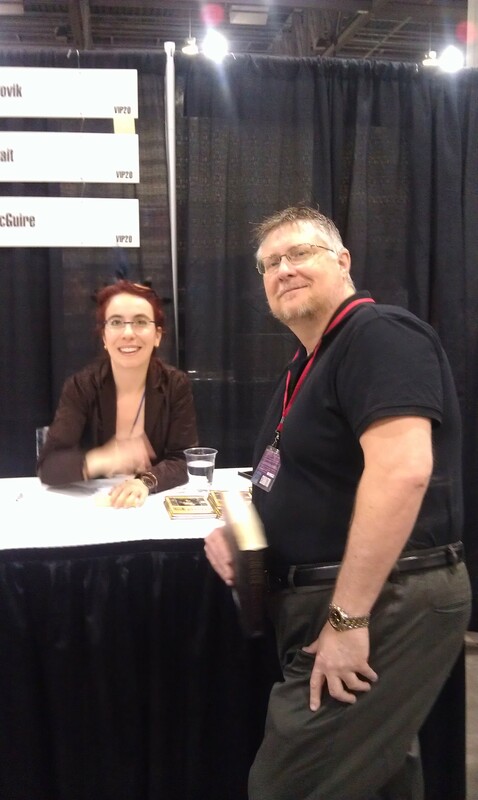 I was very pleasantly surprised to find that Naomi Novik would be at Phoenix Comic Con 2014. So, I left my booth in the capable hands of my wife and friends and stood in line to get her autograph. My appreciation for her work came from a random coincidence. I receive free books from publishers through Patti Hulstrand in exchange for my reading and reviewing them. I read over a book a week, in addition to writing my own, so this works out well for everyone. I am usually disappointed at the quality of books I receive, even from major publishers. I was very happy as I opened Blood of Tyrants and started to read to find that the author, Naomi Novik, wrote outstanding prose and has great characterization. As a result, I actually spent my own money to buy her other books in the series and I am rapidly going through them. 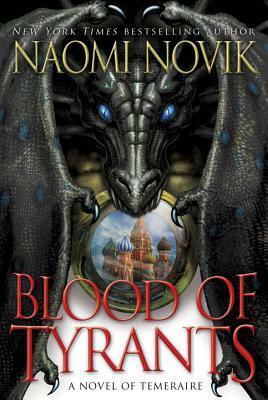 Blood of Tyrants is the eighth book in the Temeraire Series by Naomi Novik. Generally, it is difficult for me to properly evaluate a book starting at book eight. I must admit I had never read any of the series prior to this one. The two main characters are Captain William Laurence and Temeraire. Temeraire is a dragon, though one of remarkable intelligence and character. What helped me out surprisingly is one of my most hated overused writer tropes or devices – the character with amnesia. I was immediately impressed by the pacing and the outstanding prose of Naomi Novik who immediately makes you interested in the characters and their adventure. This particular book takes place in the orient during the Napoleonic Wars, early nineteenth century. I was so impressed that I went out and bought the early seven books so I could read them as well. I have finished the first two but seem to have missed buying number three, so I am stuck for now. I definitely recommend reading them in order. Naomi Novik creates a world that in many ways is a realistic historical novel of the Napoleonic period, heavily reminiscent of Patrick O’Brien’s Master and Commander series, the Horatio Hornblower series by C. S. Forester, or the Sharpe series by Bernard Cornwell. In this way, her novel is far from revolutionary. Then Naomi Novik mixes in the concept of dragons used to fight in the war. This is not very original either, as other authors have done so, such as Harry Turtledove’s Darkness Series which recounts World War 2 in a medieval setting with Dragons as aircraft, behemoths as tanks and magic for nuclear weapons. Similarly, local author Michael Stackpole uses the same concept in The Crown Colonies Series, only set during the American Revolution. Dragon Riders of Pern by Anne McCaffrey and countless others have trod this literary path. What makes this book worth reading, is not the historical sense, nor the use of dragons in an otherwise near historical tale, but instead her excellent characters and writing. Any published author will tell you that excellent writing has very little to do with the story and very much to do with the characters. The relationship between Captain William Laurence and his companion Temeraire is as engaging as Captain Jack Aubrey and Doctor Stephen Maturin or Sherlock Holmes and Doctor Watson. She captures every detail and nuance of their characters, friendships, conflicts, self-revelation and discovery in a delightful and artful way. I was unable to find any fault at all in the book and strongly recommend the series to any science fiction or fantasy readers. The series also deals with war and adult issues but refrains from any language, violence or situations that would be inappropriate for younger readers, so I can safely recommend it for everyone age twelve and above. The first book in the series, which I recommend you start with is entitled His Majesty’s Dragon and is widely available in bookstores and online. Her new series of books, starts with Uprooted, due out June 2015 from Del Rey Books, an imprint of Random House.